Casey's birthday is on Monday, and I wanted to get him something hobby-related. 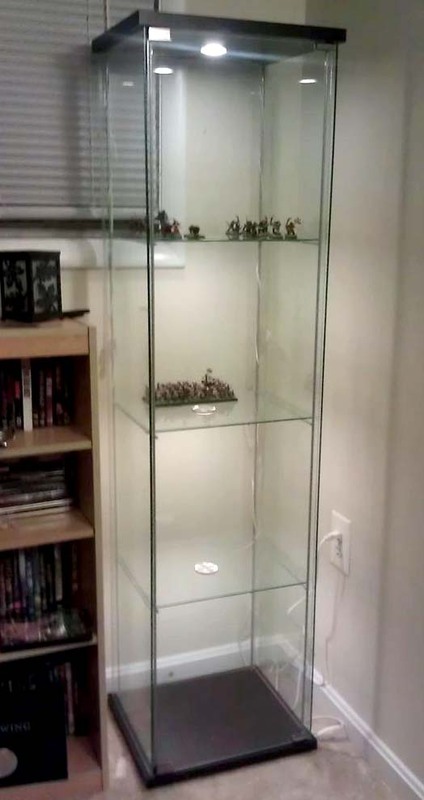 We've been talking about getting some sort of display case for our (his) miniatures and I actually found one. A pretty great one. The best part? It cost less than $100. Those really nice and fancy glass display cases cost a ton of money, and they're mostly geared toward retailers. Ikea, though, has a pretty nice one called Detolf. It comes in black or beige and it's on clearance for $65. I spent another $30 on one of their light sets to illuminate each shelf, Dioder (white, not the multi-colored). I included the links, but don't buy it online and ship it to yourself- shipping was $125. Yes, $125 for shipping. I drove an hour to get it in person. It weighs 90lbs (seriously) so bring a friend (I actually brought Casey to help me pick up his own gift, poor guy) to assist you. It definitely needs two people to put it together, too. But, the way the shelves are attached makes it ridiculously easy to put in the lights and tuck their wires out of the way. My trusty staple gun secured them to the top piece and together along the back. The lights are very bright LEDs and illuminate the minis better than I thought they would. It's not quite as bright as one of those expensive retail ones, but it really does a nice job. For the price, you can't beat it. In fact, I like it so much that if I had another $100 laying around, I'd go buy another set. They'd look really snazzy as a set on either side of our TV. I have yet to buy something from Ikea that doesn't weigh a ton. My wife loves the place and I always get stuck loading and assembling. Luckily, the Orlando store is about 8 miles away. Well it's 90% glass, so I wasn't exactly expecting it to weight nothing. This is the only thing I've bought from them so I have no comparison point. I'm trying to buy another one! 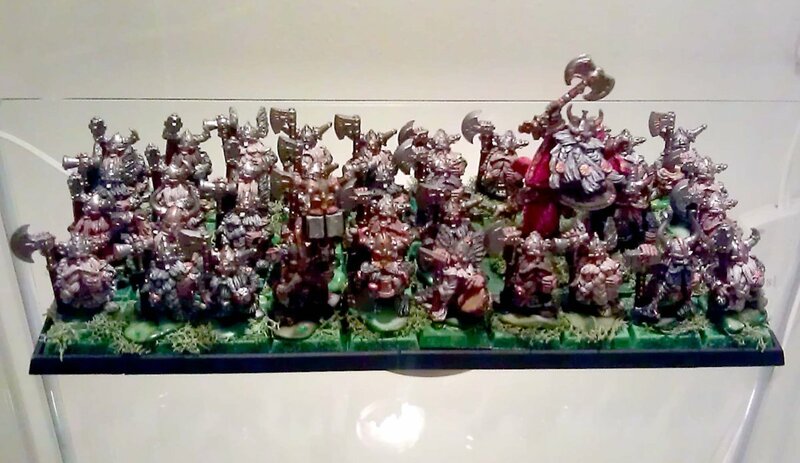 We have too many minis for only one, and we have the perfect spot for it. Just not enough funds at the moment. yeah, ive got three of these.. and i kinda need another.. but i'm out of space!